IMPORTANT Shipping Information: The ViperStore.com Ships its Dodge Viper parts and accessories to North America, Europe and more. For Alaska, Hawaii, U.S. territories, Canada and Europe - You may check out using US Mainland Shipping Rates. Once we receive your order we will then invoice you for the extra shipping. We always try to consolidate overseas orders to save you the most money possible. To know what the shipping would be before you order - Please call or email us for amount of extra postage. 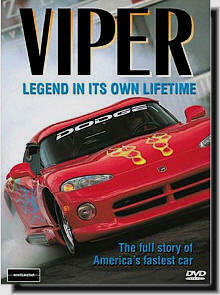 AM-DV-DVDS90 VIPER - Legend In It's Own Lifetime! Super Fast, Smokin' Tires and burning up the race track! This program tells the whole story –from the introduction of that first production car in 1992. 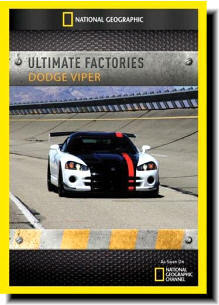 Takes you into the Viper factory and on to the production line. Then out on the road at 140 MPH in the RT/10 hard top convertible, as well as cruising in the sleek GTS coupe. Then hit the racetrack in the fearsome GTS-R , the racing version of the Viper that, within just 3 years of its introduction, took a World GT2 Championship as well as the GT2 class win at LEMANS! And much more! We hear from the key players in the creation of the Viper and from those currently involved in the designing and building of Viper’s past, present and future. Run time is 75 minutes. DVD's can be exchanged for another of the same however, we can not give a refund for DVD's. Detroit's only hand-built production car, the Dodge Viper, is born, bred and built in Detroit, Michigan. National Geographic takes a unique insider's look at the Viper factory in the current model's last year of production. This ultimate factory is comprised of craftspeople who spend two and a half days building each Viper, which is packed with 600 horsepower that can take it from zero to 60 mph in under four seconds. Without any robots on this assembly line, every Viper is truly hand-crafted. Priced at half of the cost of Ferraris and Lamborghinis, only 26,000 Vipers have hit the road in 18 years.